During a blackout, the city erupts into chaos. With Breed on the brink of war, Keystone has only 24 hours to complete a secret mission. Raven seeks help from the most unlikely of places, but at what cost? As usual, Dannika knocked it out of the park. Another tense adventure for Raven and Christian with some interesting new characters. I can't wait for the next book! Nicole Poole is awesome once again bringing all my favorite characters to life. In 2012 I discovered Dannika's work with the 99 cent purchase of Sterling. Since then I have read EVERY book she's released. I have NEVER been disappointed! 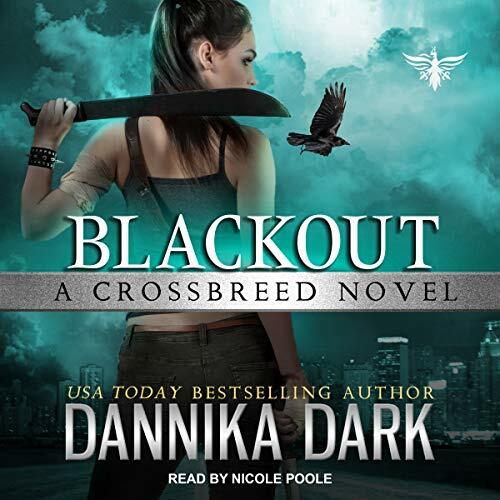 Having fallen in love with the Keystone agents I stayed up waiting for Blackout to show up in my Audible library! I couldn't wait for Blackout to be released and took advantage of the pre-sale. This Crossbreed story line is a phenomenal series of books with characters easy to fall in love with. Every chapter is a joy to read. Every book leaves you craving the next. I am addicted and if you love creative, sizzling fantasy novels with exciting plot twists you will be too! Devoured this book in two days (I have two small children so I had to occasionally stop reading to feed them, lol) because the story was so captivating I didn't want to stop listening. Nicole Poole does a stellar job giving voice to the characters I adore. Every character has their own unique voice. The storyline and delivery are worth every penny! Another tantalizing cliffhanger with the promise of missed Easter eggs from the previous books in the series. I'm amazed as usual. Ms. Dark ensnared me again and I am flummoxed by the ending . I want more! I love this series so much! Please start at the beginning of the series, Keystone, it’s much better that way! I loved getting more Shephard, he is a great character and we got to really see the soft side and a glimpse of the man he was before Maggie, his love died while pregnant with their son. I loved the ups and downs of Raven and Christian’s relationship. I adore them! I loved the way the Keystone team worked on restoring order when there is a blackout and lives are at stake. The way the story goes from 1st to 3rd party POV gives you the intimacy of Raven’s stream of consciousness while still seeing what the other characters are doing and thinking as well, even when Raven doesn’t. As always, Nicole Pool’s narration is flawless. She has such a fantastic range, you sometimes forget it’s not a full cast recording! She is brilliant. Another dazzling read by Dannika Dark and performance by Nicole Poole. One of my favorite things about this series as well as all the rest is the character dynamic and banter. This book in particular definitely clears some things up with Shepherd which is great. I'm still waiting to learn more about Gem, Niko, Claude, and Blue. Learning more about Raven and Christians relationship development is the reason I draw breath in this life 😉 besides all that the book has an interesting plot that kept me on the edge of my seat. Can't wait for the next! Amazing Like always! Can't wait for the next book. All of Dannika Darks books are my all time favorite, each one holds a place in my heart. I cannot wait for the next book!!! Everything was great! The love scenes were HOT, and I was on the edge of my seat throughout the book, and Nicole Poole was amazing (as always). I personally prefer my books to end perfectly, with each character happier than life itself, but Dannika Dark managed to leave things with the perfect Cliffhanger (never thought I would be so satisfied with a Cliffhanger Haha). I think I may have to just re-read the series over and over until the next book is released. amazing! edge of your seat! love it!!!!!!!!!!!! !